Ronaldo Vieira in action in his first season with Leeds United. Talented youngster Ronaldo Vieira has delivered a boost to Leeds United by putting pen to paper on a new four-year deal with the club. 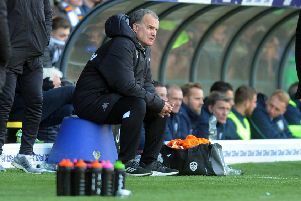 The 18-year-old enjoyed a highly successful first year in the Leeds first team in the season just finished and has been rewarded with a pay rise and a new contract that replaces his previous three-year deal, tying him to the Elland Road club until the summer of 2021. Vieira received his first international call-up last week and is currently training with the England under-20s squad selected ahead of the Toulon Tournament in France. His rise at Leeds, who originally signed him to their youth-team ranks from the i2i academy, has been dramatic since he signed his first professional deal only last May. Vieira was handed an immediate debut as a substitute against Preston two days later and has been part of United’s first-team squad ever since. Vieira played 38 times in the 2016-17 season and scored his first goal away to Norwich City in November. United, meanwhile, have confirmed that more than 15,000 season tickets have now been sold for the 2017-18 Sky Bet Championship campaign. The number has now passed the 2016-17 total with Leeds already sure of their highest number of season ticket holders since 2004.